The nicest sandy beach on Indian Lake! Comfortable, clean and cozy 2 story NON-SMOKING house. 2 bedrooms (queen and full), 2 full bathrooms plus outdoor enclosed shower and sink with hot and cold water. All bedding and towels supplied. Washer, dryer, dishwasher. Fully outfitted kitchen. 2 flat-panel TV's, DVD. Wi-Fi. Large deck with gas grill, dock, floating swimdock about 200 feet from shore. Breathtaking sunsets. Use of canoe (use at your own risk). Peaceful 200-acre clear, spring-fed lake with 2 islands. Great sandy beach for swimming. The lake is shallow so it warms up quickly in the summer. The best bass & pickrel fishing right off your own dock. Ten minutes to ocean beaches, restaurants, shopping. Twenty minutes to Newport. Great restaurants, coffee shop, gym within a mile. Five miles to the University of Rhode Island. Beautiful 6-mile bike path a few miles away. This is a peaceful, family neighborhood. The house has a wonderful little beach. Canoe or kayak on the beautiful lake. Plenty of sun for everyone and the best sunsets every evening. I'm so glad you enjoyed the lake house again this summer! Yes, the sunsets are amazing. Thank you for spending your vacation here again, and I've got the week reserved for you for next summer! What a wonderful week we had at Tracy's lake house! We loved having our "own" lake right in the backyard - it was so peaceful and relaxing just being out in the water every day. We used the canoe and our kids loved catching fish right off the dock. There's nothing better than having a glass of wine on the dock while your kids go for an evening swim during a spectacular sunset! The house had everything we needed - small but cozy and clean, and all of the neighbors we met were kind and welcoming. Only 10 minute drive to the beaches, shops, restaurants, etc. We would definitely stay here again! I'm so glad you and your family enjoyed your week at the lake! It is such a great setting for families because there is something for everyone to enjoy! The adults can relax if they choose to, while the kids fish and swim and play in the sand. And when you are ready to get out, there is lots to do close by! Thank you again for spending your summer vacation at Indian Lake! Great time on the lake again! This is our third year staying at this lake house. The owner Tracy has made some nice improvements to the house and as always there is everything we need to have a pleasant stay, even water toys and loungers for the lake. It very peaceful and we love the sunsets and plenty of opportunities to catch fish. We discovered a new car museum in Portsmouth/Newport area which was awesome. If you or your kids are into sports cars, this is a must see museum! It's always a good time and my boys love coming here year after year. Tracy is great to deal with and we thank her for renting her home to us year after year! Thank you for once again choosing to spend your summer vacation at my house! I appreciate the feedback and the information about the museum. I hadn't heard about that! I hope that your family has made many wonderful memories that will last a lifetime. Perfect location for all the beaches and restaurants! The neighborhood was quiet and very friendly. The house had all that we needed and the homeowner was very nice to work with. The peaceful dock overlooking the calm lake was my favorite aspect and a reason I would ask to rent again. The dock provided a great place to sit and talk while looking at the wildlife on the lake. We were overall very pleased with this rental and would rent again! I am so glad you enjoyed your stay at the lake. It is very peaceful out on the dock - watching the wildlife, and of course the amazing sunsets. I hope that we see you again next summer! This is a wonderful, well maintained property. We had a terrific vacation! The house has everything you need for a great week. Your own beach, dock and deck. Close to all South County dining and attractions. We think anyone would enjoy a stay at this house on Indian Lake. I am so glad you enjoyed your stay at Indian Lake! It is my goal to make sure you have everything you need so you can relax and enjoy, so I'm happy that's what you experienced! My family and I stayed at this house for a week in August 2017. The lake was perfect for fishing and swimming. The water is very clean with little to no boat traffic or noise. 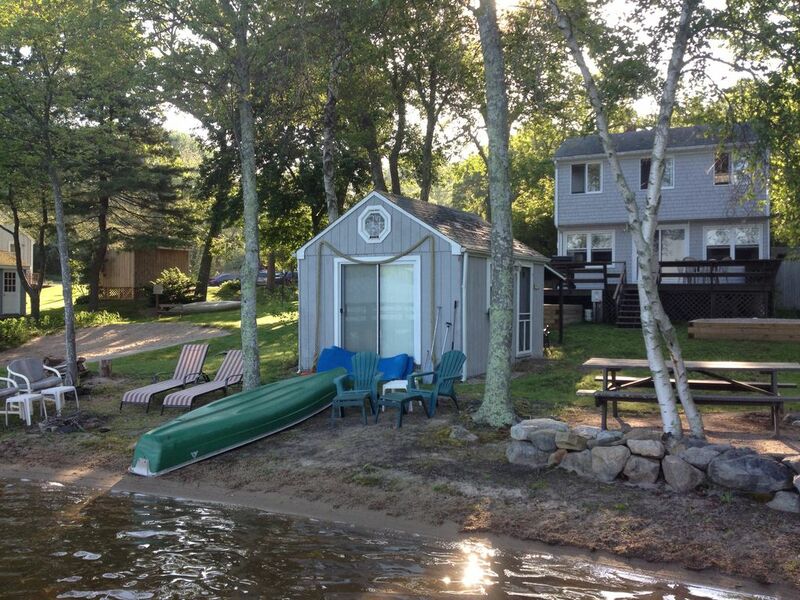 The private dock and small sandy beach are also great. It would have been better if the yard was fenced in as I have a small child and a dog, but none of the neighbors had fences so it could possibly be against community association rules. Otherwise, cozy and clean house; minutes away from amazing ocean beaches; short drive to Newport; and perfect spot right on the lake with some of the prettiest sunsets I've ever seen. Highly recommend this rental. I'm so glad you and your family enjoyed your stay on Indian Lake! It's nice not to hear the sound of boat motors racing up and down the lake - they only allow a max of 10hp, so that keeps it peaceful for the residents. And it makes those beautiful sunsets even more tranquil! Thank you again for staying at my house!